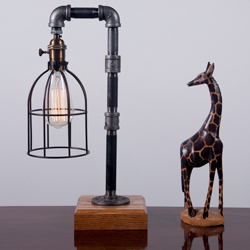 Named for the usual setting in which a bulb requires protection from the hazards of a worksite using a "cage", this is a simple and yet stylish vintage lamp which is perfect for any environment. If you happen to have stray ping-pong balls flying in the vicinity of this lamp or plan to use it on a work table, the cage may actual serve its intended function! This retro-style lamp is the perfect accent to a desk, end-table, or mantle. The included 40 watt bulb is not as bright as bulbs you may typically use in your home, but allows for direct viewing and appreciation of the old-style filament wiring pattern of the Edison bulb. While it definitly provides a soft, warm illumination, in many respects this small lamp focuses on style and atmosphere, rather lighting a room! From Kristen of Charlestown, New Hampshire on 1/20/2018 . I loved the look of this lamp when I saw I‎t online! I can honestly say I‎t looks even better in person! I highly recommend I‎t!! You won’t be disappointed! From Anonymous of Summerville, Massachusetts on 1/15/2018 . I love this lamp! Came across this as sort of a whim and ordered it for my husband for his birthday. We both love it. It's not the brightest lamp in our den, but it's definitely the one most commented upon!